I’ve wanted to be in the healthcare field for as long as I can remember. 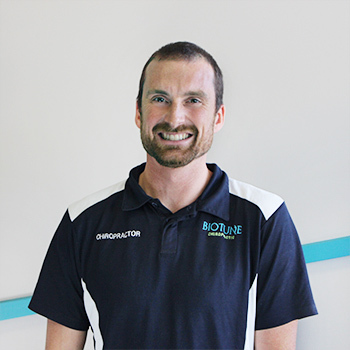 I started off taking a year of sports and biomechanical studies at Edith Cowan University. It was a thoroughly enjoyable experience, and I was ecstatic to find out that my application to Murdoch University’s chiropractic program was successful. In the third year of school, I had the opportunity to travel to Durban, South Africa. I spent a month there treating professional surfers on a World Champion tour. Then, in my fourth year, I was one of two students selected to go to the U.S. for a two-week scholarship study. While there I worked alongside physical therapists and trainers, treating professional baseball players for the Seattle Mariners — a major league team. During the rest of my studies, I thrived on helping athletes at volleyball competitions, rugby tournaments and any other events I could participate in. I graduated in 2007, and since that time I’ve only seen my passion for chiropractic increase. Every time I help an individual achieve the freedom that you can only get from being well, I feel my love for the profession grow. I’m friendly, easygoing and look forward to helping you get better. There is one type of patient that really motivates me and keeps me excited about what I do. Whether they are seeing me to get rid of pain or to improve their performance in a certain area, I love helping people who have the drive and motivation to do what it takes to make their goals happen. I try to practice what I preach so that when I am giving advice to people, I can speak from experience. Over time, I have worked at creating a daily routine of exercise, stretching and good nutrition. With vigorous exercise comes the occasional sprain or strain, so thankfully I have a brilliant team who look after me and keep me going. Contact our team today to get the time and attention you need to improve your health!